BAR NONE is Geneva’s new contemporary bar that exhibits an unrivaled art designed to excite, invigorate and satiate in ways the city has never experienced before. Bar None will offer a captivating nightlife space, where exclusive clientele can enjoy their night beneath luminous lights and lounge at VIP tables while enjoying stunning visual imagery and the best sushi in Geneva. The music will never be louder than your conversation, Bar None makes sure that the atmosphere is one where you can relax and still have some fun. A blend of lounge and eletronica help create a state of pure relaxation. Treat yourself to Bar None’s full dinner menu featuring an array of tasty delights. 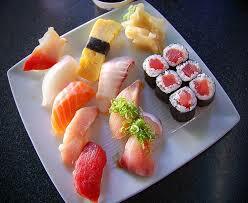 Bar None offers a complete sushi menu for your night out on the town.